When I was a kid we had Smurf shrinky dinks and I thought they were the coolest thing ever, so a few years ago when I found shrinky dink paper I was very excited! The original inspiration for this project came, I believe from a magazine, several years ago. I have done this project many times and in many variations with kids I have taught but have been dying to do it with the Bee and The Bean. The project is inspired by the artist Dale Chihuly, a glass artist from Washington state who makes incredible blown glass sculptures and instillations. If you have never see his work check out his site, it is amazing! So instead of making our sculpture out of glass we used plastic. We begin with blank shrinky dink paper, you can get this at a lot of craft stores or online, and then colored our paper using markers and crayons. The thing I really liked about this project is that anyone who can scribble can do it. We put out several sheets of shrinky dink paper and the Bee, Bean and I all took turns coloring on it. The more colors, layers and patterns the more interesting your finished sculpture. Once we finished coloring I cut the paper into a bunch of random, organic shapes. The more wiggly the shapes the better. 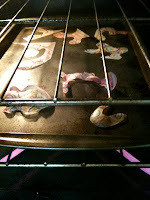 I then placed them onto a baking sheet and stuck them into a 350 degree oven. Next comes the fun part, you have to carefully watch them and wait for them to start curling. 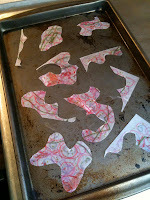 If you have ever done shrinky dinks before you know that the plastic curls up before flattening back out and shrinking. In this case you want to pull the plastic out when it starts to curl up. 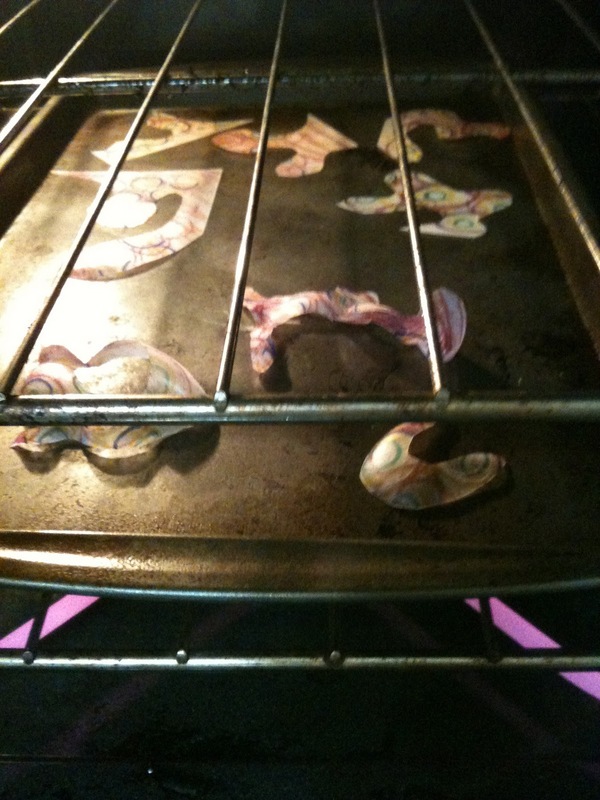 When you pull the curling shrinky dinks out they cool in just a second, freezing them in these beautiful curling shapes. In the past I have made these into ornaments and pendents by putting a hole in them before I baked them or magnets by sticking a piece of magnet tape on the back. 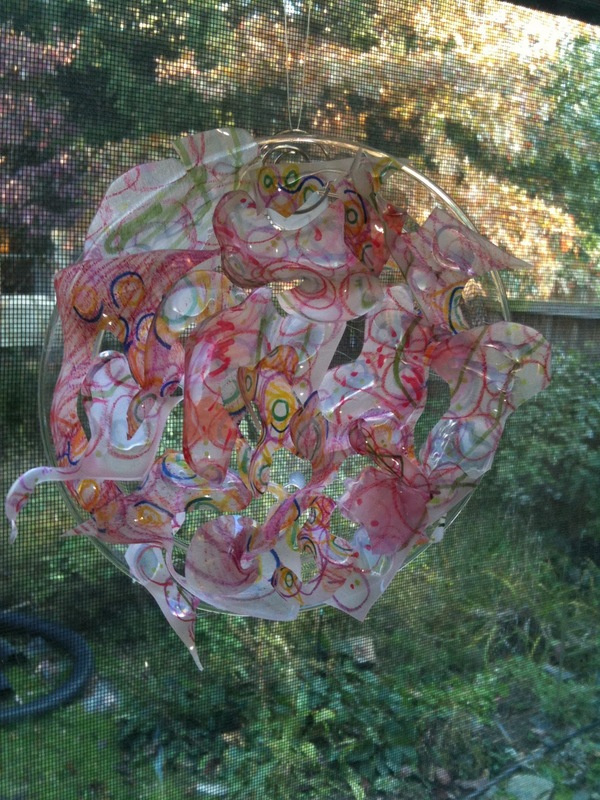 However this time I thought I would make them into a sun catcher for our kitchen window, so I hot glued all the pieces to a clear plastic plate. Then hot glued a paper clip to the back of the plate, ran a piece of fishing line through it an hung it in our window. It really is beautiful and looks a lot like glass when the sun comes through! The girls think it is very cool and have enjoyed checking it out every time they come to the sink. Oh, how I loved Shrinky Dinks. I can't wait till my little one is old enough to do this. Fun!